All drawings copyright © by John Northall. personal surveys of and observations at the site. A bold part of my reconstruction is the square tower on the highest point of the larger hill. There is a lot of fallen masonry here, more than there is adjacent to it (which is ascribed to the Kings Hall by the Royal Commission), and I think it's too substantial a mound not to be a tower. This is of course conjecture but it would certainly fit the older Welsh pattern of having a keep at the highest point as in Carndochan, Dolwyddelen, Castell Y Bere, Dolbadarn and Ewloe. The RC plan shows the front of a structure divided off from the hall which it says was built in 1250AD and was 90 ft by 30ft. 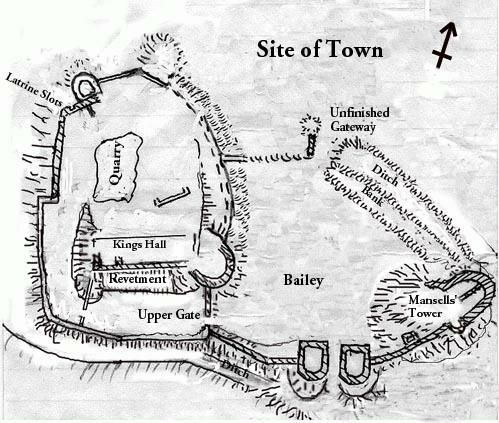 As for the lone tower on the smaller hill - it doesn't show in the sketch but the tower was quite definitely apsidal and must have been shaped pretty much like the 2 apsidal towers at Castell Y Bere, but perhaps a bit smaller. I wasn't sure if it reached the edge of the rocks, as I have drawn it, but there is certainly a wall line around the edge which could be tower or curtain. I decided eventually it was probably tower. Again, this fits with other Welsh sites. It also fits with the ground plan published in the Royal Commission. 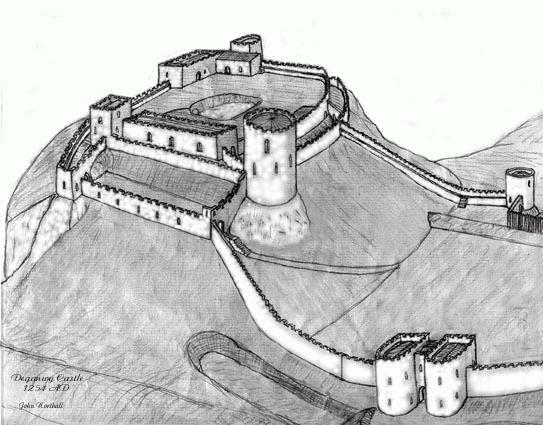 Things not so obvious in the sketch are the double upper gateway with enclosed killing zone as at Dinefwr, and the small tower on the far side of the hill with attached small hall and latrine chutes. Also not apparent and not shown on the RC plan is a double wall line on the most easily attacked side of the larger hill, the west side facing the smaller hill. There was also a "barrier" on the west of the small hill and this appears to be a mantlet similar to the weaker side of Denbigh castle, but was unfinished. It had been ordered built in Henry III's time at the same time as "raising" a tower and enclosing the bailey in mortar and lime. There is a cave leading off from the quarry near it's south-western corner heading off towards the sea. It has a solid blind end and doesn't seem to go anywhere and I'm not sure wether it is contemporary to the castle. The Royal Commission map calls the quarry ancient and there is a similar but smaller one on a local hill-fort / llys called Bryn Euryn and another within Dinas Bran. Bearing in mind that there are no water supplies to these sites I think the quarries may have been used as water cisterns. The quarry at Deganwy seems to be lined with clay, which is unnatural on a volcanic hill, and this would support the water cistern theory.